Nearly Human (one billionth of a human brain) is a deeply flawed physical metaphor for a human brain. Like many brain (and other biological) metaphors, it is much too simple and mostly wrong. But it's also an attempt at being a little bit right in ways that are non-typical for popular representations of brains. All metaphors are approximations; when a metaphor is used often enough we sometimes forget this, and start confusing the metaphor with the thing it is meant to represent. This is particularly true in complex subjects, like bio-medical research, where the full story tends to be messy and incompletely understood. Popular accounts of research into human intelligence and the brain tend to over-use certain metaphors, in particular the idea of brain as a more complex version of an everyday technology. Depending on the era it might be brain as system of steam pipes, brain as telephone switching system, brain as digital computer, or most recently, brain as computer network. While none of these metaphors is completely wrong, and they do help illustrate a primary aspect of how brains function (lots of parts connected and communicating with one another), they also promote a much-too-simple idea of what is and isn't known about brains and intelligence. * Image is subtitled "How the supercomputer Blue Brain simulates human thought." Blue Brain does not simulate human, or any other kind of thought. 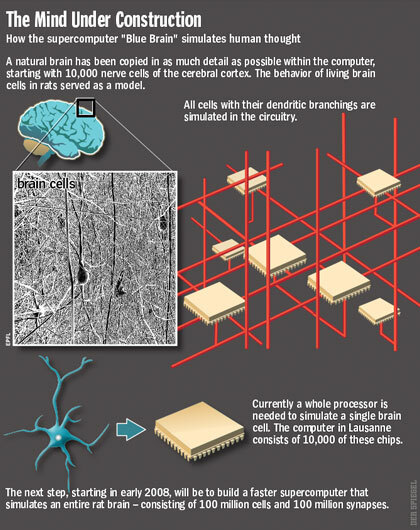 It simulates a tiny slice of mouse brain. * A drawing of a human brain, rather than a mouse brain (they look quite different!) is used to illustrate where the simulated brain cells come from. 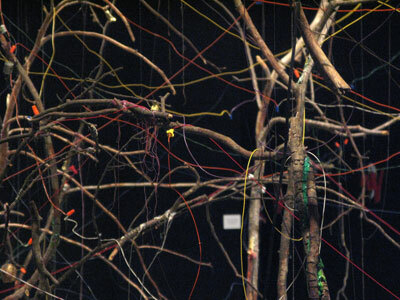 * A visual analogy is attempted between a dense tangle of neurons and a set of square computer chips connected by red tubes. * Implies that the "next step" simply involves building a faster computer so that they can simulate 100 million rather than 10,000 brain cells and synapses. To be fair to SPIEGEL, Blue Brain founder Henry Markram has claimed "We have achieved the ability to build a brain microcircuit, an elementary unit, and now it's just a matter of scaling up." So the text is an accurate representation of a questionable claim. This dynamic -- results being overstated, press accounts making vast simplifications, researchers feuding over claims -- is, for better or worse, a normal part of how science works. The reason I'm interested in these kinds of stories (and there are many of them!) is not that I think there's something inherently wrong with this process (science has always worked this way), but rather that understanding that this is how science works is an essential part of making sense of what and how we're learning about the world. 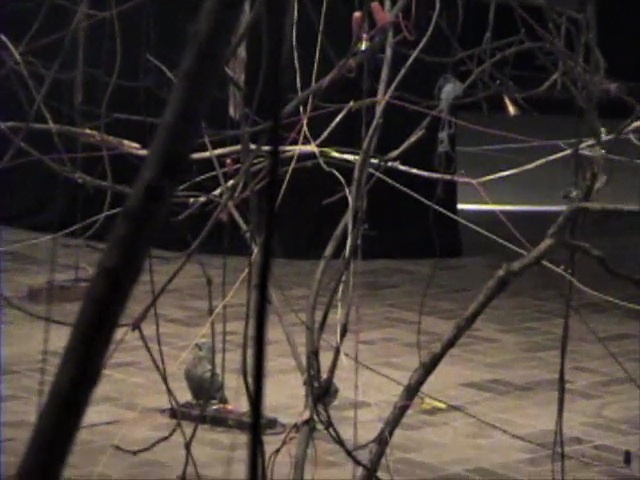 Nearly Human (one billionth of a human brain) was commissioned by the Neuberger Museum and presented as part of New Media: Why in the spring of 2009.